WHAT IS A NEW THOUGHT EVOLUTIONARY? Hello. My name is Jim Lockard. I have been in the New Thought Movement for 28 years, since 1989. I have been an evolutionary, which I define as one who has a sense of affinity for the evolutionary development of people and systems, for my whole life. Hence – New Thought Evolutionary. My book, CREATING THE BELOVED COMMUNITY: A HANDBOOK FOR SPIRITUAL LEADERSHIP (LINK TO AMAZON.com) (LINK TO AMAZON.CA), is on this topic for those in spiritual leadership. This blog is my attempt to really take a look at the New Thought Movement (which I will define below) and its progress, or lack thereof, in developing as a well-known and widely accepted vehicle for personal and planetary transformation in the 21st Century. I have a particular interest in the New Thought family called Centers for Spiritual Living (CSL) – (LINK), as that is my own heritage. But this blog will go beyond CSL from time to time at least, to explore the movement as a whole and the other families within it. My interest is in having an ongoing conversation about New Thought in the context of leadership, evolutionary development, and the creation of sustainable models of organization that take the principles of New Thought to the people who seek them. I would define the New Thought Movement as a group of organizations, large and small, who make it their mission to teach New Thought principles. New Thought principles emerged during the latter part of the 19th Century, mostly in America, and trace their lineage through Ralph Waldo Emerson (LINK) and the Transcendentalists and people like Phineas Parkhurst Quimby (LINK), Mary Baker Eddy (LINK), Charles and Myrtle Fillmore (LINK), and Ernest S. Holmes (LINK). There were, of course, a number of other prominent people in the development of the New Thought Movement. Many of them are included in this site based on New Thought History (LINK), and there are other resources that you can find on the web. Essentially, New Thought principles, which are actually based on ancient wisdom, say that there is an Infinite Creative Power that created out of Itself our universe and everything in it, as well as any other universes that may exist. This Power, being infinite, transcends all and includes all. Everything in our universe (which, after all, is the one we are concerned with) is energy and intelligence and the interaction of these two basic elements of being create everything that exists. As self-aware beings, humans have evolved the capacity to use our minds – our thoughts, feelings and beliefs – to create our individual and unique experience of our existence and to co-create with others our collective experiences. So our thought is our key to our experience of life. 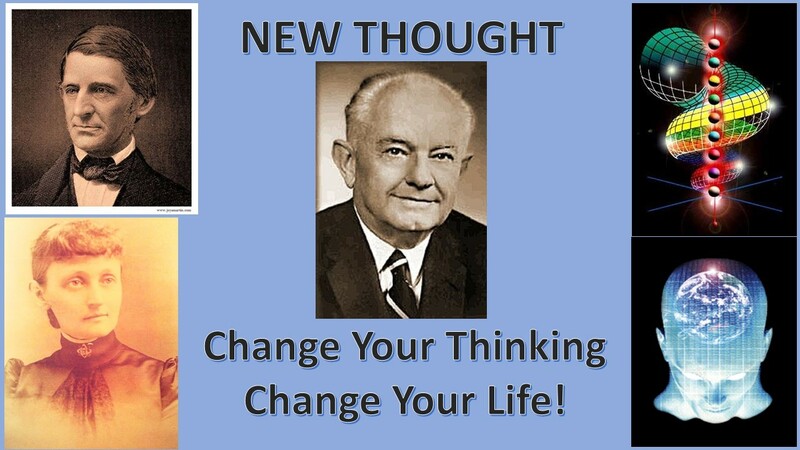 So new thought organizations, centers, churches, groups, and other organizational forms work to bring these basic principles – stated in different language with varying points of emphasis – to people who are interested in personal spiritual development and who tend to see our collective human experience as being a spiritual one. Using these principles and “spiritual technologies” like affirmative prayer, meditation, sacred service to others, and combining them with knowledge of modern psychology, we can be empowered to amplify our expression of who and what we are in a more positive and powerful way. In other words, we can have a greater experience of life by expressing our authentic inner qualities more and more. These principles and their application are the key to creating a better life and to bringing healing to negative circumstances. Using the principle “As Within, So Without,” for example, we learn to recognize that our outer experience of life is a reflection of our inner state of mind and emotions. By changing the inner state, we generate a change in our experience of the outer state, and, often, in the nature of the outer state itself. The principles of New Thought as taught by the various organizations have relatively small degrees of variation. And, you might think from my description of the principles that anyplace that taught them would be in great demand. Yet, that is often not the case. Many centers and churches struggle to stay in existence. This seems odd – how can a place teaching essential principles for successful living, and techniques for applying those principles, be anything but successful? That is the Big Question that I plan to address and to seek your input on in this blog. Why indeed? So the focus here is more future than past, more what is possible than what is hard to imagine, more big picture than small picture. If that is not your thing, thanks for stopping by, and you are always welcome back any time. If that is your thing, and you have something to contribute, feel free to comment on any post. Comments will, of course, need to be approved, and I will base that decision on relevancy to the topic and whether or not I feel the comment to be constructive (including constructive criticism). Perhaps together, we can engage in productive, big picture conversations that provide valuable input for those who are in leadership in our organizations and for those who aspire to be, so as to assist us all in directing the evolutionary process in a way that leaves a positive legacy of New Thought for future generations. Thank you for your kind words. If you send me your email address, I will make a PDF for you. Send to DrJim@CSLSimi.org and be sure to say what it is for. I actually had shivers running through my body as I read this. Your raw, frank and honest comments, and deep wisdom, need to be heard by all. You should present this as a Ted Talk. Hi Jim. I deeply appreciate you for taking this conversation to a higher level. I’ve been asking questions along this line, but finding the answers I come up with tend to have the built-in paradox of suggesting actions that build a stronger organization when my desire is to build a stronger consciousness, in community. It has struck me that the organizations have the immense value of introducing us to our spiritual nature, but we must then make the journey on our own, in alignment with others of like mind but unencumbered by structure. Recently Dr. Carol Carnes spoke at our Centre about this teaching being ‘catch and release’, to use the fishing analogy. That made so much sense. But earlier, a volunteer walked out into the middle of the sanctuary, finger wagging up and down, clearly counting heads. So, when the focus is on numbers, is it possible to have a ‘new thought organization’, or has that identifier become an oxymoron? I am so thankful for finding CSL when I did, and for my experiences of personal evolution as a result, but now I find I am more available to (r)evolutionary opportunities when I am in communion through my computer. I’ve come to the realization that for me, evolution demands action. Being demands its expression. I’ve been asking myself about how to take this teaching to the streets and make a difference in my community through acting on my spiritual awareness. I’ve realized I can’t ask my spiritual community to take the lead. I must do that myself. Where is our teaching headed when the internet provides a better analogy for the activity of Spirit than the organizations that brought us to this point? I believe your blog not only discusses the answer, but is a demonstration of it. I look forward to continuing the conversation.